Last week, Russian Prime Minister Dmitry Medvedev went to North Africa on official visits to Algeria and Morocco — two days in each country. In Algeria, Medvedev was privileged to meet with President Abdelaziz Bouteflika, prompting the pan-African weekly news magazine Jeune Afrique to remark acidly that French President Emmanuel Macron and German Chancellor Angela Merkel are still on the waiting list to see Bouteflika. He added, “The friendship between Russia and Morocco began long ago, and there is every reason to believe that it will only grow stronger and develop for the benefit of the peoples of both countries." Should the Medvedev tour be seen as a manifestation of Russia’s new strategy? Its approach until recently barely extended over to the Arab world's “Far West." Is it a symptom of some internal changes within the Russian political apparatus, given that Medvedev has been largely preoccupied with domestic affairs, whereas foreign policy and especially the Middle East were very much in the domain of Russian President Vladimir Putin? Neither of those scenarios appears to be the case. Medvedev's visit didn’t come out of the blue. A Russian diplomat with knowledge of the visit's details told Al-Monitor both Algeria and Morocco had been put on the prime minister’s travel schedule at least six months ago, with intense preparations across several ministries ever since. He has long been engaged in Algeria. In 2001, Russia and Algeria signed an agreement on a strategic partnership. For the next 16 years, economics and — to a larger extent — military-technical cooperation have come to dominate the bilateral agenda. By 2016, the annual trade turnover between the two countries, according to Medvedev, amounted to $4 billion — the lion’s share of which came from Russian weaponry. More than 90% of Algerian arms are exported from Russia. Algeria's annual exports to Russia are limited to several hundred million dollars. In an interesting diplomatic twist, this trip marked a reunion of sorts between Medvedev and an old confrere. In 2010, when Medvedev was Russia's president, he met with Ahmed Ouyahia, who was in his third term as Algeria's prime minister. Just two months ago, Ouyahia was unexpectedly tapped to return to the position, enabling him to resume working with Medvedev. Among the dozen documents signed during Medvedev's recent visit, the most notable included those on oil, gas and nuclear power development. Some sources reported the two parties might have discussed Algeria's potential purchase of Russian S-400 missile systems, and Su-32 and Su-34 fighter bombers, as well as the potential for Russian companies to manufacture trucks and bulldozers in Algeria. As is often the case with senior Russian officials’ tours to the region, Medvedev’s trip to Algeria was combined with his visit to Morocco. Not only does the strategy make sense for logistical reasons, it's also designed not to offend either neighbor. As with Algeria, Medvedev’s economic dealings with Morocco heavily dominated the agenda. Although the Russian-Moroccan trade turnover of $2.5 billion is much lower than that between Russia and Algeria, it has a different structure and is on a constant rise. With Algeria, the prevalent component is military-technical cooperation, but Russia’s trade with Morocco centers on agriculture, with a number of small- and medium-sized businesses being important players, which nurtures deeper bilateral ties. Also, trade relations between Russia and Morocco seem much more balanced than those between Russia and Algeria. In Morocco, Medvedev signed a dozen accords, mainly in agriculture, but the parties also reportedly reached key agreements for Russia to supply liquefied natural gas (LNG) to Morocco. Last month, Russian Energy Minister Alexander Novak was also in Morocco, where he said that the construction of an LNG regasification terminal was underway and that the two states discussed gas deliveries by the Russian companies Gazprom and Novatek. What can be called the “pedantic parallelism” that Moscow pursues in constructing relations with Algeria and Morocco likely indicates Russia’s unwillingness to dive into complex regional games in the Maghreb, and its aspiration to limit, by and large, its relations to an economic agenda. Another indicator of Russia’s balancing act in the region is Moscow’s neutrality on the Western Sahara issue. Delegations of the Algerian-backed Polisario Front — the Sahrawi people of Western Sahara's movement for independence from Morocco — visit Moscow every spring, hosted by the Russian Foreign Ministry and the Federation Council (Russia’s Senate). Russian officials have always been careful not to make any anti-Moroccan statements. Algeria has accommodated Western Sahara refugees in camps for decades. The “parallelism,” however, should not be misconstrued. Russia is perceived differently in Algeria and Morocco and occupies a different place on each one's list of foreign policy priorities. For Algeria, Moscow has always been an important partner. From 1954-1962, the Soviet Union actively supported the country’s national liberation movement and the National Liberation Front, a socialist political party. Soviet universities educated future leaders of the Algerian military and a large part of the national intelligentsia. And when the Soviet Union began allowing cybernetics into its own academic curriculum, Algerians were among the first lecturers the Soviet leadership invited. Today, the Museum of Modern Art of Algiers hosts a collection of both Soviet and Algerian artists who used to live in Russia. The “special relationship” between the two countries survived the downturns of the 1980s — against the backdrop of the crisis of socialism — and the economically rough 1990s. Moreover, the very nature of Algerian statehood makes its leadership refrain from an excessive rapprochement with Europe and keep an emphasis on its independence from its former parent state, France. It’s a totally different case with Morocco. Its traditional association and cooperation with the EU, as well as the political familiarity between the Moroccan and Saudi monarchies, are all natural constraints to a more intimate alignment with Russia. This background implies that no matter how skillful Russia is in its parallelism diplomacy, should Moscow have to increase its political involvement in the region it will need to further diversify its contacts with both countries. In Algeria's case, Russia is likely to actively develop humanitarian ties, to boost existing military-political interaction. With Morocco, Russia would have to place more emphasis on promoting economic ties to compensate for the lack of vibrant joint political formats. That, however, is a matter for the future. So far, Medvedev's visits have demonstrated that Moscow is not forging a new Russian strategy in North Africa, but rather is naturally seeking to capitalize on its success in Syria and position itself as a main security supplier to the region. More and more terrorist groups swear allegiance to the Islamic State of Iraq and Syria (ISIS) and the international attempts to bring down ISIS seem in vain. The strongest extremist organization gains the terrain, both on the ground of Syria and Iraq and in the minds of people far from the Syrian and Iraqi borders. ISIS challenges the Security Services all over the world, as the way it spreads is extremely difficult to be cut and controlled. ISIS spreads primarily through the Internet, using it as a sophisticated instrument of propaganda, recruiting and expanding, along with personal contacts of its recruiters. Spreading over the net, they create cells as metastases, far from the Syrian and Iraqi borders – in Nigeria, in Libya, in Yemen, in Afghanistan, in Algeria, in Tunisia and others. The list is already long and is becoming longer. The alarming message has come from a Russian senior security official after a session of the SCO’s regional anti-terror body, saying that some warlords of the prohibited Emirate of Caucasus have pledged their allegiance to ISIS. This trend challenges not only Russia, over 1700 citizens of which have joined ISIS, and who fight in Syria and Iraq (this figure is an estimate, the real numbers could be higher still), but for the whole Caucasus region and the neighbouring countries. IMESClub presents you the 40-pages-length issue of "The MidEast Journal" – collection of the 2014 brilliant pieces of our eminent members. ❖The IMESClub interview of the year: Interview with Bakhtiar Amin, Chairman of the Board of Directors of the Foundation for Future, Former Human Rights Minister of Iraq. The interview was devoted to the Iraq, its fate, on the US role and etc. 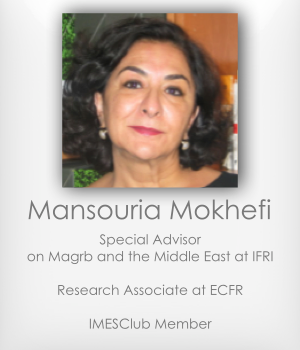 ❖Brilliant dossier on Russia-Algeria relations by Mansouria Mokhefi, Special Advisor on the Maghreb and the Middle East at Ifri, Research Associate at ECFR. The issue is available in PDF in one click. Le président Bouteflika est le grand absent de la campagne électorale qui a commencé le 24 mars et s’est achevée le dimanche 13 avril, puisque celle-ci a été confiée par procuration à ses lieutenants, qui ont sillonné le pays pour lui, tenu des meetings à sa place et prononcé des discours en sa faveur sans que lui n’apparaisse jamais. Fatigué, affaibli et diminué par l’accident vasculaire cérébral d’avril 2013 qui a réduit ses facultés de langage et de mobilité, Bouteflika est un fantôme dans cette campagne mais aussi le grand favori du scrutin du 17 avril car peu d’Algériens doutent de la victoire annoncée et programmée de celui qui, à la tête du pays depuis 15 ans, a décidé de briguer un quatrième mandat. Faute de proposer un nouveau programme, une vision nouvelle pour le pays, le président s’appuie sur les progrès, les avancées et les réalisations sous ses trois mandats. Quel est donc le bilan de Bouteflika ? Rappelons d’abord que Bouteflika avait déjà marqué l'histoire de son pays quand, après avoir participé à la guerre de libération contre la puissance coloniale française, il était devenu ministre des Affaires étrangères du président Boumediene, un poste qu’il a occupé pendant plus de dix ans durant lesquels l’Algérie a acquis une réputation internationale depuis lors perdue et jamais retrouvée. Poids lourd de l’OPEP, leader du tiers monde, champion d’un nouvel ordre économique international, médiateur de conflits internationaux, l’Algérie portait une voix qui s’entendait et comptait, et le pays éprouve encore une profonde nostalgie pour cette période de gloire symbolisée par Bouteflika. Après le décès de Boumediene, Bouteflika disparaît de la scène nationale et entame une traversée du désert (ou était-ce un exil doré ?) qui durera plus de 20 ans avant de réapparaître comme l’homme providentiel au cœur d’un pays ravagé par une guerre civile qui, en 10 ans de violences meurtrières, a fait plus de 100 000 victimes. En 1999, Bouteflika accède à la présidence d’un pays meurtri et profondément traumatisé et son objectif premier est de tenter de ramener le calme, d’encourager le retour à la paix et de réconcilier la nation avec elle-même. Il fait alors adopter par référendum et met en œuvre la « concorde civile », qui prévoit une amnistie partielle des islamistes ayant renoncé à la lutte armée et n'ayant pas de sang sur les mains. En 2005, il fait adopter la « Charte pour la paix et la réconciliation nationale », le cadre qui prévoie des indemnisations pour les familles de disparus et des aides pour celles des terroristes, et en 2006, il fait libérer près de 1 500 islamistes condamnés pour terrorisme, indiquant par là même qu’ils ne représentent plus aucun danger pour la paix et la stabilité du pays. L’acharnement de Bouteflika à ne pas s’effacer après trois mandats successifs, à s’accrocher au pouvoir malgré son état de santé et à refuser une transition qui permettrait au pays de tourner la page sur cette phase de son histoire ne risque-t-il pas de ternir de manière irrémédiable l’image de l’homme providentiel qui a permis le retour effectif du calme et la reconquête de la paix en Algérie ? Bouteflika ne risque-t-il pas par son obstination de remettre en cause la place que son rôle depuis l’indépendance lui accorde dans l’histoire de son pays ? À l’arrivée de Bouteflika à la tête du pays, celui-ci se libérait à peine de l'emprise du Fonds monétaire international et de la Banque mondiale, qui lui avaient imposé des mesures draconiennes. Mais, depuis le redressement des prix du pétrole en 2000, l'Algérie a engrangé des revenus considérables qui lui ont permis de rembourser sa dette, d’accumuler des réserves de change estimées en 2013 à 200 milliards de dollars et de s’engager dans des projets de construction et d’infrastructures estimés à plus de 500 milliards de dollars. Grâce à cette manne financière, l’Algérie a réalisé plus d'infrastructures en 10 ans, entre 2003 et 2013, qu'en 40 ans, entre 1962 et 2002, Bouteflika ayant lancé un programme colossal pour chacun des trois mandats : un Plan de soutien à la relance (PSRE) de 6,9 milliards de dollars en 2001, un Plan complémentaire de soutien à la croissance (PCSC) de 155 milliards de dollars pour la période 2005-2009, puis un plan quinquennal 2010-2014 de 286 milliards de dollars, dont 130 milliards pour terminer les travaux du plan précédent. En 15 ans, le pouvoir a considérablement accru les dépenses, dépenses qui ont nourri et développé la corruption politique à tous les niveaux de l’État et de la société, provoquant des scandales qui sont tous remontés à la sphère du pouvoir, très près de l’environnement le plus proche du président. Impressionnés par les réalisations économiques de leur pays,- l’Algérie dispose du PIB par habitant le plus élevé d’Afrique du Nord - les Algériens ont aussi vu leur PIB par habitant passer 2 500 euros en 1999 à 5 600 dollars en 2013, ils ont vu l’émergence d’une classe moyenne et la constitution d’une classe d’entrepreneurs, les nouveaux patrons de l’Algérie, millionnaires et milliardaires dont le poids politique commence à se faire sentir. Cependant, malgré l’amélioration du quotidien de millions d’Algériens, la pauvreté perdure, le chômage devenu structurel prive d’avenir des milliers de jeunes (on estime à 10 000 le nombre de jeunes qui tentent chaque année de quitter le pays illégalement pour rejoindre l’Europe) et l’agitation sociale est devenue une marque de la vie algérienne, avec des émeutes quasi quotidiennes, sporadiques mais néanmoins récurrentes et révélatrices de la profonde insatisfaction de la population. Si le pouvoir a réussi de manière ponctuelle à « acheter » une certaine paix sociale en procédant aux « saupoudrages » financiers qui ont jusqu’à présent réussi à démobiliser tout mouvement de contestation, il a aussi laissé proliférer les marchés informels qui ont d’abord masqué les taux de chômage (plus de 20% parmi les jeunes), puis ont pris le dessus sur la vie de économique nationale, dont ils dominent une grande partie, estimée selon certains à plus de 50%. Certes, de très nombreux Algériens restent attachés à Bouteflika, qu’ils considèrent comme le père de la nation, et peu doutent de sa victoire finale ; mais cela ne les empêche pas d’être inquiets devant les redoutables défis que le pays doit relever, défis que la campagne électorale n’a pas abordés, le débat de cette campagne s’étant limité à l’état de santé du président candidat et à quelques promesses de « transition » visant à amender la constitution, soit pour une plus grande ouverture (promesse du candidat Benflis d’inclure dans le débat politique ceux des Islamistes qui en demeurent exclus) soit pour la création d’un poste de vice-président (engagement du clan présidentiel). Les défis auxquels le pays est confronté et que tout gouvernement devra affronter sont restés en suspens : ni les troubles qui agitent régulièrement la Kabylie ni les affrontements qui déchirent le Mzab depuis des mois n’ont été discutés; ni l’épuisement des réserves d’hydrocarbures, ni ses conséquences sur une économie tributaire de ce secteur qui représente 40% du PIB, 70% des recettes fiscales et 97% des recettes d’exportations, n’ont été abordés ; ni le fléau de la corruption, ni les scandales qui lui sont liés et les détournements de sommes colossales n’ont été discutés ; ni la situation politique régionale ni l’insécurité aux frontières sud du pays n’ont été analysées. Cependant, les Algériens savent que malgré des avances remarquables, l’économie nationale reste plombée par des lourdeurs bureaucratiques handicapantes, un chômage structurel et un secteur public tentaculaire, une économie informelle envahissante et une corruption généralisée ; ils savent aussi que dans un tel contexte, les changements nécessaires ne sauraient se limiter aux mesures préconisées par les candidats mais nécessitent un changement du système dans son intégralité et un renouvellement de génération. Bouteflika a permis à l’Algérie de sortir de l’isolement dans lequel la guerre civile l’avait plongée ; dépassant la relation « privilégiée » avec la France et celle traditionnelle avec les pays d’Europe, Bouteflika a entrepris de diversifier les relations diplomatiques et commerciales de l’Algérie en se tournant vers de nouveaux partenaires et en créant de nouveaux liens. Si l’Algérie n’a pas retrouvé encore la place importante et la voix forte qu’elle avait longtemps eues en Afrique, elle s’est employée à renforcer les relations avec les États-Unis et s’est tournée vers les grandes puissances du XXIe siècle en développant de nouveaux liens avec la Chine, l’Inde, la Corée du Sud, le Brésil et la Russie. Les relations russo-algériennes se sont nouées pendant les années de la guerre de l'Indépendance (1954–1962) lorsque l’URSS a apporté son appui politique au Front de Libération Nationale (FLN) et son soutien matériel à l’Armée de libération nationale (ALN). La position de l’URSS a été déterminante dans la conclusion de la guerre car elle a poussé les puissances occidentales à faire pression sur la France pour mettre un terme à un conflit en passe de devenir un autre foyer de tensions dans la guerre froide qui divisait le monde. Son indépendance acquise, l’Algérie s’est alignée sur Moscou et a adopté le modèle de développement socialiste, Moscou apportant une importante contribution à la création d’une base industrielle nationale et garantissant la formation professionnelle des nouveaux cadres algériens, une composante fondamentale de la coopération mise en place entre les deux pays. Si l’Égypte de Nasser était à cette époque le pilier de la politique soviétique au Machrek, l’Algérie était le partenaire le plus important au Maghreb, et la relation privilégiée entre Alger et Moscou a marqué toute la présidence de Boumediene (1965-1978), celui-ci ayant d’ailleurs vécu ses derniers jours à Moscou où, souffrant d’un cancer, il y recevait des soins médicaux. La disparition de l’URSS d’une part et le conflit entre l’État algérien et les islamistes de l’autre, ont dès le début des années 1990, éloigné les deux pays, chacun préoccupé par des priorités intérieures qui ont, pendant un moment, relégué au second plan leurs relations avec l’extérieur. La renaissance de leurs relations fut entreprise en 2001 avec la visite officielle de Bouteflika en Russie (3-6 avril 2001), qui a donné une nouvelle impulsion aux relations bilatérales, avec notamment la signature de la Déclaration de partenariat stratégique, le premier accord de la sorte signé par la Russie avec un pays arabe ou africain. La visite officielle entreprise par Vladimir Poutine en Algérie le 3 mars 2006 a été marquée par l’annulation de la dette militaire algérienne estimée à 4,7 milliards de dollars et suivie par la signature de nombreux accords de coopération économique. Les retrouvailles avec l’Algérie ont permis à la Russie, en pleine redéfinition de ses rapports avec le monde arabo-musulman, d’opérer un retour au Maghreb, qui demeure une zone stratégique de la plus haute importance à un moment où Moscou est engagée dans son retour en Méditerranée, et s’inquiète fortement de l’expansion des extrémismes et du terrorisme dans les pays du Sahel. Par ailleurs, la relation avec Alger est confortée par le fait que les deux pays font la même lecture du Printemps arabe, de la Libye à la Syrie, et que Moscou reconnaît le rôle de puissance régionale de son allié algérien, rôle que Moscou contribue à renforcer avec l’étendue de la coopération militaire qui lie les deux pays. En effet, la Russie est le principal fournisseur d’armes de l’Algérie, 91 % des importations d’armes de l’Algérie étant originaires de Russie. En acquérant 11% des armes que la Russie vend à l’étranger, l’Algérie en est son troisième client après l’Inde et la Chine, une place qui fait de l’Algérie un partenaire de choix depuis la réactivation de l’axe politique Moscou-Alger. Outre la coopération militaire, les deux États gaziers ont mis en place une coopération hautement stratégique dans le domaine énergétique – rappelons que Gazprom (125 milliards de mètres cubes) et Sonatrach (61 milliards de mètres cubes) représentent à eux deux 36 % de l’approvisionnement en gaz de l’Union européenne – un autre volet des relations russo-algériennes, et non des moindres. Ainsi, s’agissant de la politique intérieure, le bilan de Bouteflika s’avère très mitigé et peut légitimement être discuté, mais son bilan en termes de politique étrangère ne fait l’objet d’aucun débat tant tout le monde s’accorde à reconnaître que, sortie de la guerre civile, l’Algérie a retrouvé sa place dans la communauté internationale, s’est engagée dans une diversification de ses partenaires tout à fait rentable et prometteuse, a imposé dans toute la région la Russie comme contrepoids fondamental à l’influence que les puissances occidentales continuent d’exercer dans la région et, portée par la puissance de son armée, s’est imposée elle-même comme la puissance régionale indispensable.